Gordon Beach has announced that there are now 22,836 BDM certificates available through his website Australian BDM Certificates. Congratulations, Gordon, on your great work for the Australian Genealogy Community. Ninety years ago this week my Mum was born in Cobar, NSW. Wondering what was happening there during the week of her birth I turned to Trove. Here are some of the stories I found. Mr. M. L. Pryor, acting postmaster,has been officially notified that he hasbeen appointed to the position ofpostmaster at Cobar. Mr. Pryor hasno idea when he will leave for Cobar. Mr. V. Farrier, mining inspector,who is at present holiday-making in8vdney, will probably return to BrokenHill on Saturday next. As soon as hearrives Mr. J. R. Godfrey, who hasbeen relieving him. will return toCobar, where he is stationed. So what do these snippets tell me about the town in which Mum was born? Cobar had a Post Office and a new Postmaster. I wonder if he still was the Postmaster who employed Mum when she went to work there at age 15. I knew that Cobar was a mining town as employment opportunities at the mines is what brought my grandmother's family to the district. If my grandmother would have been inclined she could have had a train ride east with her new daughter. It's a shame that the train line to Cobar has now been closed. My poor grandmother must have been very uncomfortable in the last few days of her pregnancy with temperatures in Cobar reaching 110 degrees fahrenheit. I notice that Marilyn Rowan has an Australia Day special. so, if you are in the market for some transcriptions now is the time to act. Copied below is Marilyn's announcement. 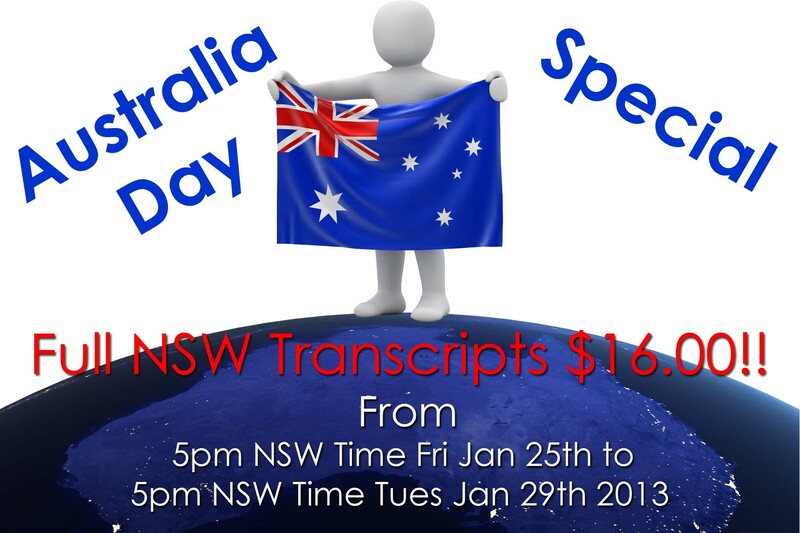 AUSTRALIA DAY LONG WEEKEND SPECIAL NOW ON! One of the perks of being an Official Rootstech Blogger is that I get to play Santa Claus. As they did last year the people at Rootstech have given me a Registration to give away to one of my lucky readers. Even if you have already registered for Rootstech you can enter the competition as the organisers have said " "If your winner is already a registered attendee, we will apply a credit for their existing pass and issue a refund." The Conference this year promises to be HUGE with a new Getting Started stream, an Expo space that is expanded by 40% and new Story@Home classes. Add to that special lunches and social events, the opportunity to do a spot of research in The Family History Library and to mix with a few thousand like-minded people. No wonder I am making the trek from Australia for the third year in a row. If you would like to be in the running to win one complimentary three-day registration to the RootsTech 2013 Conference in Salt Lake City, to be held at the Salt Palace Convention Center from March 21-23, 2013 please read on. As an Official Blogger I have the opportunity to conduct video interviews with people at Rootstech; in 2012 I conducted my first two interviews. Having viewed these I am keen to conduct more and improve my interviewing skills. The contest will close at Midnight GMT (Greenwich Mean Time) on Friday 2 February 2013. There will be only one winner of a free registration to Rootstech 2013.. The prizewinner will be responsible for all other conference expenses incurred including meals, accommodation, travel and incidental expenses. In her blog challenge for Australia Day 2013 Helen V Smith has challenged geneabloggers "to tell the story of your first Australian ancestor." I think James Westbrook was my first ancestor to arrive on Australia's shores but as there is no way to verify the paternity of Elizabeth Phipps' offspring I cannot be 100% sure that he is my ancestor. James WESTBROOK, son of Edward WESTBROOK and Elizabeth FITCHETT , was born on 3 November 1784 in London, England and was christened on 23 November 1784 in St. Sepulchre Holborn, London, England.2 He claims to have married Elizabeth PHIPPS before 1812 in England but I cannot find any evidence to support this. On 1 April 1812 he was a butcher living in Angel and Porter Court, Golden Lane Parish of St Luke Old Street, London, England with Elizabeth Phipps, a cotton spinner. He and Elizabeth had a bit of trouble with the law and found themselves before the court at The Old Bailey indicted for "feloniously breaking and entering the dwelling-house of Joseph Covington." A transcript of this trial is available online. As a result the hapless pair were sentenced to Transportation. James was one of 200 convicts who left England on the Earl Spencer on 2 June 1813 and arrived in the Colony of New South Wales 9 October 1813. On arrival he was assigned to William Cox; James worked as part of Cox's gang that built the road over the Blue Mountains. James and Elizabeth were both assigned to the Windsor area and had several children together. It is just not clear which of Elizabeth's children were Westbrooks and which were fathered by William Magick. He appeared in the convict muster in 1814 in Windsor, NSW, Australia. Between January 1816 and January 1818 he was resident in Bathurst, NSW, Australia. On 7 July 1818 he was a prisoner resident in Bathurst and he reappeared in the convict muster in Windsor in 1822 with a Conditional Pardon. James earned his pardon as a result of the work he did for Cox on the building of the road. He appeared in the census in 1825 in Sydney listed with children Louisa, Harriett, Emily, William, Ann and Sarah. This could indicate that these were his children. In the 1828 Convict Muster he was back in the Windsor area at Richmond where it is presumed that he lived until his death. James must have lead an ordinary life as I have not been able to dig up any stories about him on Trove! When he died on 14 July 1859 in Windsor Hospital, Windsor, NSW, Australia James was listed as a pauper.3,4 He was buried on 16 July 1859 in St.Matthew's Church of England, Windsor, NSW, Australia. I mentioned in my other blog that on the weekend I had ordered a secondhand copy of "Jews in Australia" by Hilary Rubinstein (as well as 7 other Australian history books. An Australian genealogist who follows that blog commented "Hi Jill, if the book Chosen: The Jews in Australia mentions my ancestor, Esther Spencer/Stubbs/Bigge (nee Salamon) I'd love to hear about it." The book arrived yesterday and I am sorry to report that the detailed index does not contain any references to the lady in question. My bundle of books that arrived promptly from Brotherhood books promises to keep me amused for quite some time. Last night we were babysitting and, after we had the kids settled, I decided to do a little bit of Troving. Knowing that new newspaper titles are being continually added to Trove I decided to see if I could find anything new on some of our direct ancestors. As Mr Geniaus was with me I started with his side of the family. His great-grandparents lived in George Street Liverpool, NSW in a house called Dorking Villa, their names were Emily and John James Ball. Their son, James Ball, Mr Geniaus' grandfather died at a very young age followed not too many years later by his wife Harriet (nee Parkinson). We have no photos of Harriet and only a tiny, tiny photo of James in a group photo of the Fire Brigade Band which, when we blow it up, is a pixellated mess. I played around with my search terms and was rewarded with some new hits that were all from one newspaper, The Cumberland Argus and Fruitgrowers Advocate (Parramatta, NSW : 1888 - 1950), that was a recent addition to Trove. Once I had found one or two relevant articles I moved to searching just this newspaper. I was surprised to find articles about Liverpool in this publication as I would not have thought its coverage would have extended to Liverpool. As the evening unfolded we found more and more articles that mentioned my husband's grandparents, great-grandparents, uncles aunts and cousins. I can't being to describe our elation as we read the warts and all stories of the Ball family in Liverpool. Mr Geniaus has been boring the socks off anyone who will listen today as he recounts the stories of these ancestors (he is not into family history but he loves these stories). I will share just one of the articles in this post. Being greedy I will save the others up for another day. Mr Geniaus is jumping for joy now that he has a photo of his grandfather. At present only issues of The Cumberland Argus and Fruitgrowers Advocate (Parramatta, NSW : 1888 - 1950) from 1888-1919 have been digitised. As Emily and John James Ball lived until 1944 and 1950 respectively in the Liverpool area imagine what treasure awaits us when later issues of the paper are digitised and made available on Trove. Need to share files easily? Richard Byrne on Free Technology for Teachers reminds us today that Google Drive is a perfect vehicle for sharing files. He is addressing the education community but his suggestion is just as pertinent for genealogists. He says "You can upload videos, audio files, PDFs, Word documents, and just about any other file to your Google Drive account and you can make access to the file public if you want to. This is how I occasionally share some of my large PDFs. Grab the link to the file by clicking the share button in your Google Drive account then select "anyone with the link" as your accessibility setting. Now you can paste that link into your Facebook page for your class or your school." I use Google Drive all the time to share documents with family and find it very effective. I also used it in 2012 to plan a Rootstech presentation with genealogists in three other countries. To access Google Drive you need a Google Account. Do consider setting one up - it gives yo access to a suite of wonderful tools. Janelle's family tree addiction: Our new book has arrived!! Better late than never - I just found this post from Australian genealogist, Janelle, telling about the book she and a group of Maria Northcote's Genies Downunder listeners published. I'll be downloading a .pdf copy of this book to my tablet. I also realised that I wasn't following Janelle's blog. Mea Culpa! The situation has been rectified. I can't wait to catch up with my blogging friends at Rootstech when I get to Salt Lake City in around eight weeks time. I was just browsing the Rootstech site when I found spotted this photo of my mate, Audrey Collins, in one of the images that scrolls across the front page of the site. As the Rootstech home page is subject to change I captured the screenshot of Audrey (looks like she's busy on her iPad) before it disappears. I know that Audrey like me is returning to Salt Lake City for her third Rootstech Conference. It looks like one can still grab an Earlybird Registration - how about doing this and joining Audrey and me for some geneafun. Wikipedia tells me that "Google Trends is a public web facility of Google Inc., based on Google Search, that shows how often a particular search-term is entered relative to the total search-volume across various regions of the world, and in various languages. The horizontal axis of the main graph represents time (starting from 2004), and the vertical is how often a term is searched for relative to the total number of searches, globally." On a whim this morning I put the search term "genealogy" into Google trends to see how popular the term is in relation to other search terms. And what did I find? It appears that since 2004 the term "genealogy" has lost popularity in relation to other search terms on Google. Now I don't think that the pursuit of genealogy is declining; my theory is that people searching for "genealogy" were probably early adopters of the Google search engine. Google Trends results for search "genealogy"
The Google Trends results page also gives a "Regional interest" map that indicates the areas where searches for the term "genealogy" have been most popular. There are no surprises here as the popularity of the term appears to be strongest in areas where English is the main language. Regional interest map for term "genealogy"
I have been following this unpretentious looking blog in my RSS feed for a few years and find it an amazing source of information. While it has a bias towards Maitland and the Hunter Region it posts news of happenings in Sydney and NSW. I don't know who is responsible for this blog but they need to be commended for their consistent effort in blogging since July 2009. I would leave some flattering comments on the posts but one is not able to comment. I hope that somehow they get to see my post and learn how much I appreciate their efforts. Have you wondered what our Aussie ancestors put on their tables? This new blog from Historic Houses Trust (HHT) that I discovered as I was preparing for my talk on History Blogs might just provide some clues (and recipes) for you. The site explains "The Cook and the Curator, brought to you by the Historic Houses Trust (HHT), invites you to explore our food heritage. Each month we’ll visit one of our extraordinary properties, introduce you to its past residents and look at what, where and how they ate. We’ll comb through old cookery books, decipher handwritten recipes, experiment with heirloom produce, rediscover lost culinary arts, and reveal family stories. We’ll also show you how to blend exotic spices, whip up apple snow, make gelatine from calves’ feet (if you dare!) and lay the perfect Regency table – and this is just a portion of what’s on our menu." I'll be adding this to my RSS. How about you? Friday this week will find me talking about one of my favourite topics, Blogging, but with a twist. I usually spruik about blogs for genealogy and family history but on Friday, at Ku-ring-gai Historical Society where I am a Committee Member, I will be looking at History blogs. There is a lot of crossover with these topics but there are also many blogs that are particularly relevant to local historians. As I have been preparing this talk I have found some wonderful new (to me) and interesting blogs. If you would like to join the Ku-ring-gai members for this event you would be most welcome (they are a friendly mob). Details can be found on the Society blog. Looking around for a Trove Tuesday item for today I decided to search for something on January 15th that happened in Cobar where my Mum grew up. I found a few things but one item that stood out was a death notice for someone in another place. The digitisation of this item was so bad that the OCR transcription was just gobbledegook. So, for today, I decided to correct that entry and spend some time correcting some of the other posts that came up as a result of my search. Whenever I find something from the Trove newspaper collection it is my policy to make corrections to that article and/or the neighbouring articles. See below the transcription and copy of article that I will correct after I finish this post. A quick search on Ancestry confirmed Therese's parents' names, this also confirmed that her surname was spelt BERSEY but I have not been able to find any other records for Therese/Theresa. I believe that we should all give back to Trove by making corrections to the OCR text thus making for more effective searches by others who may use the resource in the future. Do you regularly correct the OCR text on Trove? I notice on the Campbelltown District Family History Society Inc. Facebook page that this family is having a reunion on Australia Day and thought I would give it a mention in case any interested parties read my blog. To be held: 26/1/2013 (Australia Day). The postman just left a parcel for me. I was thinking that it might be a book I ordered from the UK but it wasn't. It was a reminder that, in less than four weeks, I will be heading off on my first Geneacruise, the 3rd Unlock the Past History and Genealogy Cruise. I wonder if any of my fellow cruisers received a similar surprise. Having just finished nominating some of my Genimates for the Wonderful Team Member Readership Award I wandered over to Pauleen Cass's blog to tell her that I had nominated her blog and there a surprise awaited me. Pauleen had also nominated the Geniaus blog for the award. I thank Pauleen for her nomination, I so enjoy the interactions I have with all of the geneabloggers with whom I communicate. 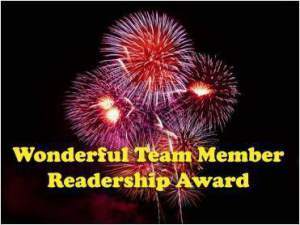 I won't add any more names to my earlier nominations, I appreciate each and every comment from all of my readers. You can see the list of Pauleen's nominations here. A lovely surprise I received this week was a nomination for the Wonderful Team Member Readership Award. Jennifer Jones nominated me for this gong by writing " Jill from Geniaus for all the encouragement she gave me in my early days of blogging. I also look forward to participating in her creative Geneamemes." You can read all Jennifer's nominations here. I firmly believe that blogging is a two-way street and I make a concerted effort to comment on a few blog posts in my RSS feed each day. I get such a buzz when someone takes the time to carry forward the conversation I have started in my blogs so I appreciate this opportunity to recognise a few of my readers who consistently leave comments on my ramblings. These readers not only comment on my blog, they support me on other social media platforms as well. As I believe in spreading the love I am choosing different people from those I nominated for the Blog of the Year 2012 Award; all of those nominees also comment regularly on my blog. The expected temperature in my town of Sydney (where I live on the North today is 43c. (for Fahrenheit people that is 109). The present temperature in the shade on my back veranda is 38 (100) and rising. As my Trove Tuesday post I have chosen this article from the Sydney Morning Herald in 1901. Thankfully our water supply is better than it was in 1901. Many thanks to Catherine of Seeking Susan ~ Meeting Marie ~ Finding Family for nominating the Geniaus blog for the“Blog of the Year 2012 Award”. Catherine wrote to me "Thankyou so much Jill for sharing so much knowledge and info... especially of the technological kind. As well as the daily E-News. 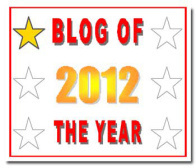 It therefore gives me much pleasure to nominate you for the "Blog of the Year 2012" which Pauleen gifted to me." Getting recognition from one's peers is special; thank you Catherine for your nomination of Geniaus I am humbled and thrilled. Catherine nominated some of my favourite blogs as well as some I didn't know. You can see the full list here. Early this morning I heard some sad news. My friend, Canadian genealogist Joan Miller, passed away peacefully on Friday 4th January, 2012. I had hooked up with Joan on the internet a few years ago and we finally got to meet at Rootstech in 2011. From that meeting grew the idea of putting together a panel presentation for Rootstech in 2012. Joan worked on this with myself, Amy Coffin and Audrey Collins until just after Christmas 2011 when she wrote "I've been having health issues and there is a good chance I won't be able to attend Rootstech." Today I am remembering Joan and being grateful for her friendship, support and encouragement. Among other things Joan was passionate about the Genealogists for Families Team on Kiva where she was co-captain with Australian, Judy Webster. A number of genealogists have asked on various social media today how they can commemorate Joan. Joan's daughter Heather has asked that commemorative loans or donations in memory of her mother should be made through Kiva and the 'Genealogists for Families' project. Details on how this can be accomplished can be found on this Genfamilies blog post. I chose to make a loan to a farmer in Kenya to help him to buy piglets as Joan had recently made a loan to another farmer to allow him to buy pigs. A job I do each New Year is to wander over to the Historical Indexes on The New South Wales Registry of Births, Deaths & Marriages site and check their updated indexes to see if I can find any new references to people in my tree. Each year another year of records is added to the index. The site now now covers the indexes to Births - to 1912, Deaths to 1982 and Marriages to 1962. A second cousin once removed on Mum's side. Missed this one last year - now confirms his birth in NSW. I didn't know about this second cousin once removed on Dad's side. Another person to investigate. A son of my Great-Uncle Tom. A first cousin once removed on Mum's side - I now have an approximate birth date. A first cousin once removed on Dad's side. I have his birth date as 1908, perhaps they took a while to register it. Thought it could be related to Legitimation but his parents were married in 1910. Not in my database but with the surname Magick she is likely to be a relation of some sort on Mum's side. Michele is a half second cousin once removed. This indicates that a marriage date in 1963 shared by a family member is not correct. I didn't find anything relevant for these family names: Curry, Gowans, Hamshere. What did you find on this site this year? 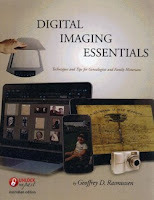 When I saw advertising about Geoff Rasmussen's book Digital Imaging Essentials : techniques and tips for genealogists and family historians (Australian edition) I was quite excited as I thought that this would be the book for me. I duly ordered a copy by mail from Gould Genealogy. Having received the book I now have mixed feelings, I have not yet completely digested its contents but have read most chapters (more than once) to form an opinion on the work. I will apply my favourite PMI strategy (with my librarian's hat on as well) to review this book. I really wanted to give a positive review of this book as it has great potential but I had to be honest. Hopefully a Revised Edition will be published soon. I trust that the issues in the print edition will be sorted in the mooted ebook version of the title. The book is a useful resource for beginners and would be a valuable addition to a library if a revised edition was published (see Minus). It has a Table of Contents and an Index. I realised that I did not need this book; it confirmed that I have a a reasonable knowledge in this area. Diagrams in the book are not labelled. The book is poorly formatted with too many blank pages and too much white space. There are many instances where text wrapping could have been employed and image sizes reduced. The number of pages in the book could have been reduced resulting in paper not wasted, trees saved and even a few cents on the final cost. The book received was supposed to be an Australian edition. Some attempt has been made to Australianise it yet American terms and examples are used eg on page 28 the author writes "if I lost the digital image of the death certificate, I could reorder it from the vital statistics department." On page 79 an American example of Minneapolis, Minnesota could have been replaced with an Australian example eg New South Wales, Australia. There are formatting errors eg on page 24 the text commences with " Above are two documents...": the documents are actually at the bottom of page 23. The scanner section ignores sheetfeed scanners that are commonly used in business to scan large amounts of paper. These are great tool for the genealogist who has lots of loose paper and photographs to scan. Chapter 5 fails to warn that not all scanners will work seamlessly with all computer operating systems or programs like Photoshop Elements or Picasa. The quality of some of the images in the book is poor. All labels on the menu bar on the screenshots on pages 123 and 124 are so fuzzy that they cannot be read. There are fuzzy images on many pages eg 40, 50, 117, 136. On page 117 the author stresses the importance of adding a citation to a digital image but appears to only give instructions for Photoshop Elements (apologies if I have overlooked the Picasa instructions. In this instance that referred to clipings from US newspapers it would have been good to show people how to save clippings from Trove with citations already attached - another case for Australian examples. One should take what one reads on a vendor's site with a grain of salt http://www.gouldgenealogy.com/2012/11/digital-imaging-essentials-the-australian-edition/. I should have waited and perused the book at a Gould event; I would not have purchased it after an inspection and could have saved my money. Ahh, the perils of impulsive online shopping. The author has based his book on a collection of 20,000 images. I had a different experience with Photoshop Elements (albeit an earlier version) when I used it with my collection of 50,000 images. I now have 90,000+ images and Picasa works well with them. I thought the file formats were TIFF and JPEG (not TIF and JPG as mentioned in the book) as shown in the diagram on page 25 and the file extensions attached to files were .tif and ,jpg. A small point but nonetheless important. Details of my next talk at my local library , Hornsby Shire Library, have been firmed up. I enjoy meeting up with local people who share my passion for family history; hopefully I will be able to share some tips that will help them further their research. Thanks to Neil Chippendale, Local Studies Co-ordinator at the Library, for the invitation to present. I will be presenting a session GeneaGoogling : Effective Google Searches at the library at 6:30 pm on Wednesday 27 February. This will be a basic session that introduces attendees to some simple strategies to optimise their use of the Google Search Engine. Although my recent journey was not a genealogy holiday I did schedule in a couple of days to visit The Society of Genealogists in London. Before my visit I was a good girl and spent a few hours consulting their OPAC and drawing up a list of resources to find. I had no trouble locating their building in a dingy part of London after my tube ride from Kensington. As it was 18 pounds per day to use their facilities and 41 pounds to join the Society I opted for membership. As I was going to spend two days there this seemed worthwhile. After filling in the membership form and being issued with a temporary membership card and a folder full of paper I was on my way. The gentleman on the desk was not particularly welcoming to me or the two Americans who were joining at the same time as me so I was pleased that I had read all of the information on the Society website before going along. Having deposited my goods in the locker room I made my way to the library to start my investigations. Within a few hours I was able to find all of the resources I was seeking although their contents did not yield the treasure I had been hoping for. There is an enormous amount of printed material in the collection but I found that their classification system did not, like Dewey, clump all resources on a similar subject together closely so browsing the shelves was not so easy for me. about which I will blog separately made me pleased about my decision to join the Society. Although it was spotlessly clean I found the environment at the Society a bit shabby with mismatched chairs and daggy carpet (an issue for many organisations with limited budgets) The computers on the lower ground floor were rather new and it was easy to get access to these as visitors on the days I attended were thin on the ground. Space appears to be at a premium in this building that is bulging with resources; the people who work here must be very fit from running up an down the stairs from floor to floor. It was frustrating that there was no wifi available in the building ; I was told that there was a trial happening soon. I would happily have paid more for this facility. One could certainly spend weeks in this establishment browsing through the resources on offer. The bias in their collection is certainly towards English resources although there is a bit on Scotland and Ireland and a few things on other countries. I just hope that I can return within the next twelve months to get more value from my membership.